One of the things that I have not grown used to, is having television interviews in Czech, that is me speaking Czech in these interviews. I’m not sure how many I have done now, but with each interview I grow a bit more comfortable. However, every time I still find myself thinking something like this – “Is this really happening? Am I really going to be on national TV in this country? Am I really speaking this language?” Every time, questions like this have gone through my mind. The most recent interview was no exception, but I had an amazing time doing it. In about 45 minutes we covered from how I first got her to Czech, to why I do what I do, and why YOU, my ministry partners, partner with me to make a difference. I hope to have the interview with subtitles but until then I wanted to share the link with you. CLICK HERE to watch the interview, then you can skip ahead to the 19:23 mark and watch the interview. While most of you reading this, will not be able to understand what I’m saying you can still appreciate the fact that we are getting what we are doing in front of many people in the Czech Republic. It’s very exciting, thank you for being part of it! 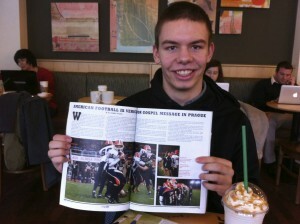 Have you seen, or read, the article about OUR ministry here in Prague and Czech?!?! I have heard some really, really good feedback from the article and I must thank my friends and coworkers with AIA back in Ohio, especially Tommy Young, for such a great article. It was such a HUGE blessing to have this story run and get out the word about things here in Prague! My question for you is, “Did you read the article?” If you have read the article please click “comment” below and let us know what you thought about it! IF YOU HAVEN’T READ THE ARTICLE CLICK HERE! A friend at work said something about giving 100% today and I said I always do, so he said I had to give 101% today and that reminded me of your 111% motto. I told him about that and about why you use it to inspire and about the culture’s apathy, etc. Well, he said that he had just read an article about a coach in an eastern block country and it turns out, it was the article about the Lions in Sports Spectrum. So he had already read about the 111% and had already known a little about Zach. Nice! I love it, “he had just read an article about a coach in an eastern block country” and it just happened to be me! Crazy and very humbling. I love what God has called YOU and myself to here in Prague, Czech and Europe! Thank you for being part of it! By the way, Lukas loved being in the magazine too! Thanks for being part of his life! So things are about to get CRAZY come this Monday! For the second time I will be flying three of my Czech guys over for the Second Czech Take Over America Tour! Each time it gets a little bit better! I’m so excited for Tomáš, Lukáš and Honza to get here Monday at 2:55 pm. “Why?” you ask. Well you can look at the map (I’m not overly excited about driving all that time, but I am excited to get tons of relationship time with my guys in the car.) and the schedule below to see why I’m amped for this trip. Is that not amazing? This time it is more geared towards helping these guys become better coaches as well as show them America, expose them to faith and more. While we are at each of these schools we will sit down with coaches for a few hours and get better at what we do – coach. It will be a “once in a lifetime opportunity” for them, and myself! I can’t wait to be in the midst of this all. Please pray that God would show up in many ways throughout the duration of our trip. By the way, America, ARE YOU READY FOR THE CZECH TAKEOVER? I just wanted to wish you the happiest of Thanksgivings from Prague! While Czechs, don’t celebrate Thanksgiving, as it’s an American or Canadian holiday, that doesn’t stop us from sharing some “Thanksgiving Love” with out Czech friends! I recently uploaded a few pictures from our Thanksgiving party at the Sports University we work at here, click here to see all of them. 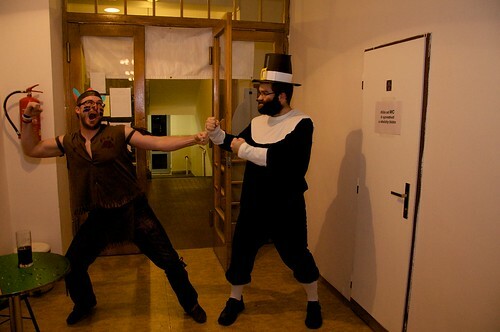 Here’s Micah and I getting our “pilgrim” and “indian” on! I know the first Thanksgiving was far more peaceful than this picture, but Micah and I like to have fun! 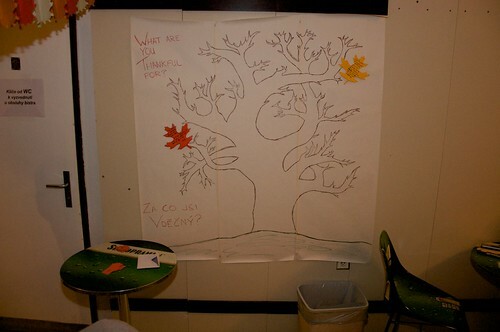 We had a “Thanksgiving Tree” at the party (by the way, the tree is my art work! ;-)), where people wrote on leaves what they are thankful, it was moving to see what everyone was thankful for! I’m thankful for many things, but one of those things I’m thankful for are the wonderful ministry partners that long to see Czechs turn to God in thankfulness! Thank you for being you and supporting what God is doing here! HAPPY THANKSGIVING! What are you thankful for on this Thanksgiving of 2011? July 30th, 2pm-5pm – Xenia – Tim Hortons, 38 North Orange St.
August 4th, 4pm-7pm – Oshkosh – Starbucks, 240 W Murdock St.
Aug. 6th, 2pm-5pm – Appleton – Starbucks, 4339 W Wisconsin Ave.
Aug. 10th, 4pm-7pm – Lake Geneva – Caribou, 883 Main St. Beyond that here is the run down of the churches I’ll be at again. I do hope to see many of you and share about what God is doing here in Czech! If any of you are interested and/or able to host a support dessert I still have dates I could fill up. Thanks for all you do to make a difference in Prague, Czech and Europe! A couple of months ago, we had our Area Staff Conference for all of Campus Crusade in Eastern Europe and Russia in Slovenia. It was encouraging to escape the gray winter of Prague for warmer temps and also a change of scenery (see pics), but it was more encouraging to see friends and also receive some encouragement from these same friends! Over the last 16 months I have been though a roller coaster of heartbreak, failings, and more. Honestly, it’s felt like more than I can handle. Thankfully, God is big and has kept me standing and moving forward through it all, but in the midst of all of this I’ve learned that I need to preach the Gospel to myself. 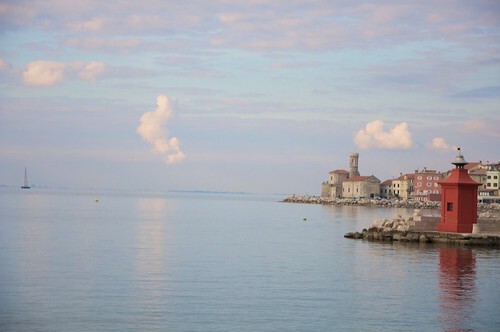 While, in Slovenia, I was once again challenged to preach to myself as I move through life and ministry in a hard place. God is good, in the midst of it all. Even when it seems dark and that God isn’t in the midst of it all, preach to myself that God knows and He is still good. This sounds “Sunday schoolish,” but I do forget often that God is good. Thus the need to preach it to myself again and again. So how about you? What truths of God and the Gospel do you have to preach yourself? Use the comments and let’s start a discussion on this, I’m interested in hearing if this hits home with others and what you might add to the conversation! Be a Revolution and Preach the Revolutionary Love of Jesus to yourself…. !